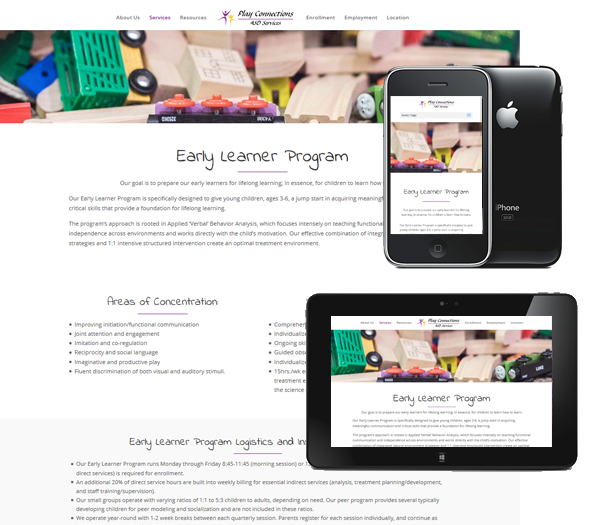 Play Connections is an early childhood autism intervention center located in Beaverton, Oregon. Adam really took the time to listen and understand our unique needs. He created a beautiful site that streamlined a lot of our systems. He is also quick to respond to any requests, large and small. I highly recommend Protocol Three for your website needs. PlayConnections.com provides professional ABA therapy and early intervention services for children with autism in the Portland, Oregon area. Protocol Three was tasked with the conception and development of a new Web presence that suited the company’s new branding and message, as well as integrating a much easier system for new enrollment and employment opportunities. We were also tasked with streamlining the company’s internal management of Google Apps used for mission-critical email, file/document-sharing, and calendar event sharing capabilities. Play Connections also depends on us for ongoing site updates, backups, management, and support.